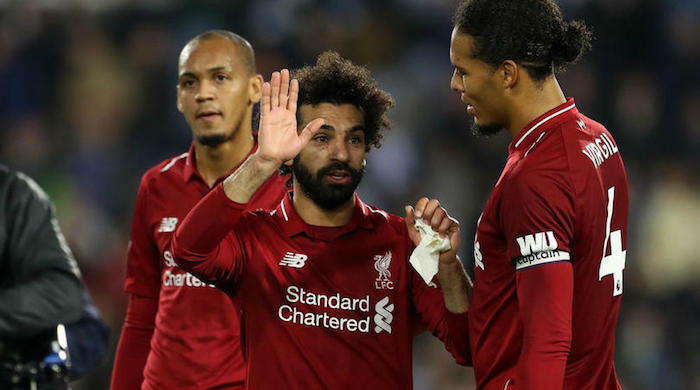 Mohamed Salah insisted he never panicked during a four-match scoreless streak that ended with the winner in Liverpool’s 1-0 victory at Huddersfield Town. The tidy finish from Xherdan Shaqiri’s incisive pass was the former Chelsea forward’s 50th goal in English football. ‘It’s a good feeling but the most important thing is to help the team get the result and now we are on track,’ Salah told BT Sport. “I’m not worried [when I don’t score]. The most important thing is the team, so as long as I help them get the result I’m not worried. ‘We had four or five players starting in the team for the first time this season in the Premier League. All of us are at the same level so everyone has to fight [for places]. The England international completed 69 minutes on his return from a groin injury and cited the club’s impressive depth as essential to their title ambitions. ‘It’s a long season,’ Lallana said. ‘It’s only a few weeks ago I was thinking about where my next game was coming from even when I’m back fit. ‘Throughout the course of the season everyone is going to have to contribute if you want to achieve something special,’ he concluded.